This small fragment has figurative relief panels on three of its remaining sides, while the back is carved out to form a crenellated semi-circular opening which narrows towards the centre of the stone; the lower portion of the stone has also been cut to create half of a square opening, which again tapers inwards towards the centre. The missing half of this stone presumably completed the circle and square to form a near-cubic shape, and was similarly decorated with relief carvings. Its function however remains unclear; was it perhaps a finial piece for a smoke censer of some sort? The surviving reliefs appear to represent narrative scenes, possibly deriving from Hindu mythology related to Siva or an avatar of Vishnu. In the one complete relief, the appearance of the male figures recalls the high striated bouffant coiffure, very simple hoop earrings, and large beaded necklace of the standing stone Siva at Kirtipur, attributed to the sixth century by Pal, while the female figure wears virtually the same belt and hoop earrings as the eighth-century stone Parvati at Visnalgar, also in the Kathmandu valley . The female figure leans her left elbow against the shoulder of the male figure. She wears skulls in her hair, large disc earrings, a necklace and three-tiered belt of large round beads, a long dhoti, and anklets. Her facial expression is now too abraded to interpret but it is not wrathful. Flames appear behind her back. She appears to be holding a flat dish which she presents to him. The male figure wears ornaments in his hair; it is unclear of what kind. His facial expression is again hard to determine, as a portion of the face is abraded, but it is certainly not contorted in rage. He holds her shoulder gently with his right hand and clasps in his left hand the thick stem of a large lotus flower (or parasol?). He wears a short dhoti. A dwarf with spiky hair stands beside them, wearing a loincloth, holding a club and making an admonishing gesture . On the right panel, a standing female is facing front, her right leg placed jauntily behind the left. She has large disc earrings and a beaded necklace, and wears a shawl around her broad shoulders. Although no blouse is visible, her belt is clearly defined and stretches to the similarly attired female figure standing beside her in profile. She in turn clasps the belt of yet another female whose face and torso are broken, only her right leg being visible. The form of belt is similar in design and in its position on the body at hip level to the eighth-century Parvati at Visnalgar. The body proportions are not as full. The three women have very slender legs, almost without muscularity despite their dynamic stance. The dhoti hem is visible just above the ankle, which has a plain band anklet. The left panel has a standing male figure, quite tall and thin, wearing his hair in a very elegant coiffure, again a high bouffant chignon like the man holding the parasol on the first panel. He is lithe and slim. He wears a single strand necklace of large beads but no earrings or crown. Still his appearance could be that of a prince, with a substitute with colour substitute with colour sash stretched across his chest and knotted at the hip; behind his shoulder one sees the same textile, as if forming a cloak. He wears a thin belt below his waist with a sash suspended between his legs. The angle of the fall of pleats is tapered both on the sash and the cloak, which recalls eighth-century images in stone and metal . The short dhoti has the hemline above his knees. He has one hand on his hip and the left hand raised at an angle, perhaps holding a staff. Although the interpretation of these scenes remains elusive and an inscription is lacking, a context in Licchavi Nepal, around the seventh to eighth century, seems very likely in view of the stylistic analogies with contemporary stone sculptures in the Kathmandu valley. 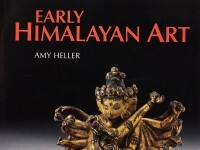 1 Pal, The Arts of Nepal, vol. 1, pls. 145–46; although similar in their jewellery and coiffure, the body is far more smoothly modelled and massive as the Siva of Kirtipur is 96 cm high, according to Bangdel and Aryal, Report on the Study of the Iconography of the Kathmandu Valley, p. 27, no. 26, where it is attributed to the third century ad. The 71 cm stone Parvati of Visnalgar is illustrated with a statue of Siva, both dated to the eighth century by Pal, op. cit., pl. 142, and by Slusser, Nepal Mandala, pl. 348. Her crown also appears to have skulls, and she has a similar round and full face; her body has fuller breasts and belly but virtually the same three-tiered beaded belt and large hoop earrings. 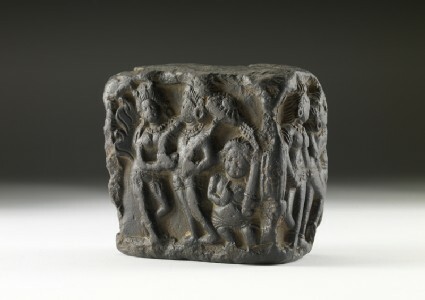 2 The iconography of Vishnu's dwarf avatar is known in the early Kathmandu valley repertoire from an inscribed stele of Vishnu Vikranta at Lajimpat, Kathmandu, dated 467, published by Pal, op. cit., pl. 2. Its popularity persisted, as shown by the ninth-century stele at Changu Narayan: ibid., pl. 3. 3 The sash ends fall in a cascade of aligned stylized pleats, somewhat similar to the stone Maitreya of Nag Bahal, Patan (H. 45 cm), dated to the eighth century by Slusser, op. cit., pl. 472. The short dhoti with a knee-length hemline is also worn by the eighth-century Siva at Visnalgar standing next to Parvati.